DALLAS, Dec 17, 2010 / FW/ — All of us has a favorite Little Black Dress, but there are times when you want to have an alternative. How about the Little Black Pants for both comfort and style. This holiday season, you can leave your LBD in your closet and go everywhere with you LBP. 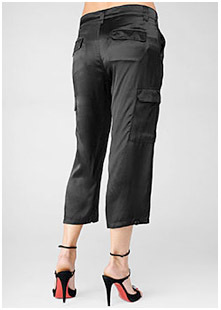 Mix style and comfort with the Divine Crop Cargo from Cj by Cookie Johnson. Made of 100% satin and cut with a fit that is sure to flatter, the Divine Crop Cargo includes a button closure at the bottom of each leg providing the versatility of a slimmer look. It is this attention to detail that has made fans out of celebrities like Eva Mendes, Sofia Vergara, Oprah and Reese Witherspoon. Cut at the perfect length to let a lady showcase her fabulous shoes, the Divine Crop Cargo combines fun with flair! Also available in Chocolate, Navy, Sage and Sterling Grey.